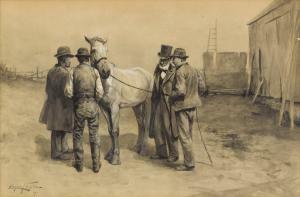 Is it Time To put Horse Trading out to Pasture? Glenn Mercer (GM Automotive LLC) published an independent study prepared for NADA in January 2017 entitled The Dealership of Tomorrow: 2025, Retail automotive trends for the next decade. The 87-page document is an interesting read. On pages 42 and 43 we like Mercer’s brief comments on negotiated transactions. Isn’t it amazing that with the changes in retailing over the last century that the automobile is still a negotiated transaction? In an age where companies such as Amazon and Apple are delighting customers with transparent pricing and sales processes that reduce friction, we are still clinging to a basic method of transacting business that is 100 years old and has been abandoned by virtually every other retail channel. The majority of customers do not enjoy the time commitment required, uncertainty and stress involved in negotiating a car purchase. We believe there are 2 primary reasons for this. Most customers don’t get much practice negotiating for personal purchases. They have not developed the skill necessary to conclude a transaction confidently. Therefore they approach negotiation with anxiety and, even when the transaction is completed, may not be sure whether or not they arrived at a fair bargain. Today there are numerous examples of better ways to transact. The effect that Amazon has had on price transparency and ease of purchase are influencing retail practices in virtually every channel. Technology is driving the availability of information (the dealer no longer knows more than the customer) and has facilitated methods of purchasing that have greatly reduced friction (Amazon one-click, for example). Customers are disappointed when a purchase of the expense and emotional significance of a vehicle is not as enjoyable as purchases in other areas of their lives. Curious about converting to a non-negotiating business model? Ryan Adams Group is here to help. Call Alan Krutsch at 612.208.8539 for information, examples, and answers to your questions. We’ve just returned from NADA100 in New Orleans and were pleased but not surprised by the amount of conversation surrounding employee retention and customer experience. Clearly recruiting the right employees and then training, motivating and retaining them is key to creating a winning customer experience. Using a One-Price selling system can increase customer satisfaction, employee retention and reduce transaction times. 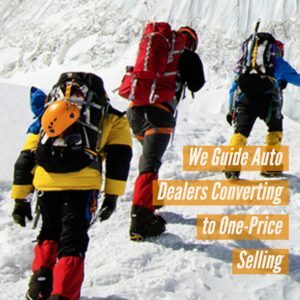 Ryan Adams Group guides dealers who are converting to One-Price selling in an effort to create a great customer experience. Check out the Roadmap to becoming a Negotiation-Free dealership. In our initial assessment, we determine the dealership’s readiness to embark on the One-Price journey. By far the most important indicators of success are management buy-in and the willingness of the organization to embrace and manage change. Change management is a challenge for many organizations. Ryan Adams Group has successfully managed this process for over 60 dealers who have converted to the One-Price model. Is facing the challenge and embracing change worth it? We believe it is. If you are interested in learning more we can arrange a visit to a One-Price dealership where you can ask questions and learn about the transition from the retail employees who successfully implemented this process. In 1519 Hernán Cortés landed on the Yucatan peninsula in Mexico with the intent of conquering the land and enriching his party with the gold and silver known to be possessed by the indigenous population. For over 500 years previous conquerors had failed to dominate Mexico. Cortés planned to do this with just 600 men, none of whom had protective armor. Rather than charging into battle, Cortés spent several days on the beach inspiring his men with motivational speeches. Cortés was intent on having his men see this conquest as not just their duty but as a cause and an adventure of a lifetime that would lead them to fame and fortune. His next decision was his most audacious. Cortés ordered all of his boats burned. His men had only two choices: victory or death. We know that Cortés was ultimately successful in his mission and became the first invader in 500 years to conquer Mexico. History tells us about other great leaders who burned the boats including Alexander the Great when his heavily outnumbered Greek forces faced the Persians. Sun Tzu mentions it as a major strategy in “The Art of War”. Fast forward to today and the One-Price movement in automotive retail. Commitment is a key ingredient in any successful business strategy. When the goal is business transformation on the scale of moving from negotiating to One-Price selling, burning the boats is perhaps the least risky path. Dealers who wish to differentiate through superior customer experience are naturally drawn to One-Price selling. To achieve a successful One-Price conversion dealers need a commitment strategy, not an exit strategy. Ryan Adams Group employs a Readiness Assessment to make sure the dealership team has identified the business need, articulated a sustainable vision and is ready to make the commitment to a new way of serving customers. Are you considering changing your business model to One-Price Selling? One-Price Selling also called Negotiation-Free Selling, is gaining more adherents as dealers large and small respond to a changing market. Here are the top 5 benefits dealers report upon adopting a One-Price business model. One-Price selling creates a better customer experience. Customers just don’t like negotiating. According to The Driving Sales whitepaper entitled Competing on Customer Experience, 99% of respondents said they start shopping for a car expecting a hassle. Furthermore, 56% of buyers said that they would buy cars more often if the experience at the dealership were better. According to Driving Sales “Poor customer experience is stifling car sales at retailers and customers want more control in the process.” Negotiations introduce uncertainty for many customers because they are not experienced negotiators and therefore get very little practice. Buying a car every three to four years does not prepare a customer to confidently negotiate one of the largest purchases they will make. One-price selling can dramatically reduce the anxiety and uncertainty that accompanies traditional sales processes. One-price selling introduces price transparency and gives customers greater control in the process which builds trust. Transparency and trust form the foundation of great customer experiences. Hiring great people is easier and turnover is reduced. How many times have you heard “it’s hard to find good help?” We maintain that there are good people everywhere but they are not looking for a career in the car business. Car salespeople are consistently ranked among the most untrustworthy professions often lumped with politicians and personal injury attorneys. When you combine the high category negatives of the retail auto business with variable compensation, limited training, demanding hours and a vague career path it’s easy to understand why recent college graduates will not consider auto sales as a starting point for their career. Add to these challenges a sales process that pays them to “price their customers, not the car” and it’s easy to see why we have a recruiting problem. The 2016 NADA Dealership Workforce Study states that non-luxury sales consultant turnover was 72% and female sales consultant turnover was an astounding 88%. Clearly what we are doing as an industry isn’t working. One-price selling offers a solution. When the sales (Product Specialist) job includes thorough training, a fixed salary, a 40 hour work week and a realistic career path both recruiting and retention results soar. Customer Satisfaction Increases. Customers want to be treated fairly and efficiently. 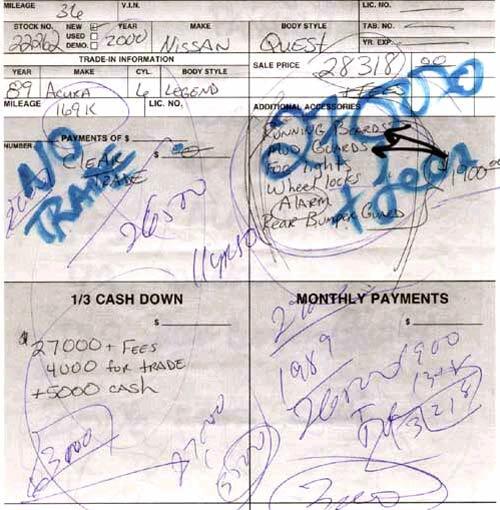 A four-hour sales process with a price that seems to be set arbitrarily, facilitated by several different people in the dealership produces uncertainty. This uncertainty leads to mistrust and confusion. A One-Price dealership that uses transparent, easy to understand pricing and an efficient F&I process can increase customer satisfaction and loyalty. Shoppers want transparency, simplicity, and demonstrable value. They demand that we respect their time. One-Price selling is uniquely engineered to meet these customer requirements. Transaction costs are reduced. Margin compression on new vehicles continues. NADA reports that the average front-end gross profit on a new vehicle is just over $1000. One-Price dealers enjoy lower personnel costs and advertising expense. As an example, NADA data reports that advertising costs per new vehicle retailed exceed $600. One price dealers typically spend less than $250. Realignment of costs is an important part of a One-Price conversion. Reducing the overall cost of selling a new vehicle by $400-$500 dollars is not unusual. Your dealership is positioned for the future. We are entering a period of disruption from both within and from outside the auto industry. Most of these disrupters are used vehicle operations and their sales volumes in relation to the overall market are admittedly small. However early consumer reaction is instructive. Companies like Tesla, Carvana and Echo Park have one significant business practice in common. They have eliminated negotiation. In the case of Carvana, they have also eliminated the sales person. In the case of Tesla, they have eliminated the franchise dealer (for now). Customers are applauding. The contrast between traditional car dealers and this new breed of industry disruptor is stark. These upstarts have reengineered the sales process to minimize the friction inherent in the traditional, negotiated transaction. They are building trust and in the process, raving fans. Price transparency is just the starting point for these innovators. While their impact on the overall market is small today they may represent a “canary in the coal mine” in signaling future consumer preferences. Dealers who are “first movers” to a One-Price system can position themselves favorably for the coming changes to automobile retailing.